Spray 3 1/2- to 4-quart slow cooker with cooking spray. Place chicken in cooker. Top with onion, poultry seasoning, thyme, pepper, gravy and celery. Gently stir frozen vegetables into chicken mixture. Increase heat setting to High. Cover; cook 30 minutes longer. Meanwhile, heat oven to 375°F. Bake biscuits as directed on bag. Spoon about 1 cup chicken mixture onto each of 6 plates. Top with split biscuits. 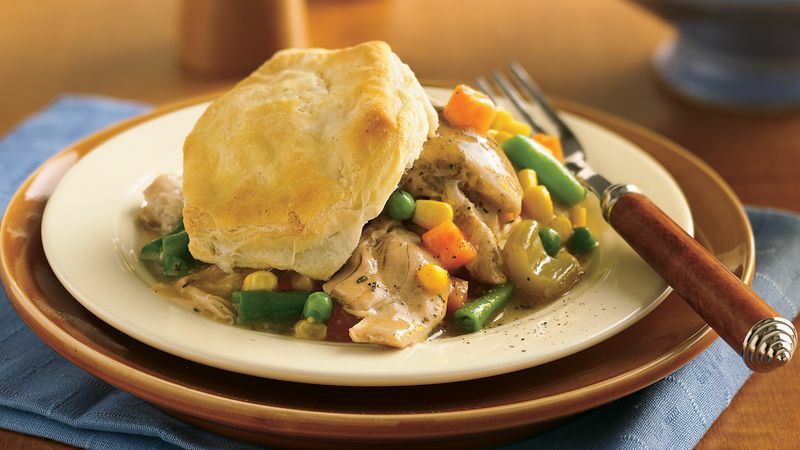 For a creamier pot pie, stir in 1/3 cup sour cream just before serving.